We are into manufacturing good quality Wooden Crates which are suitable for transporting heavy machinery used in different industries such as automobile, industrial control panels, etc. , which protects them from getting damaged while transporting. 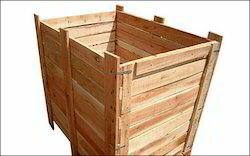 A crate is a Slatted Wooden case used for storage. Our Wooden Crate Boxes rate high on quality and are made of premium quality material. Wooden Crate Boxes are rigorously tested to assure their durability and better performance. 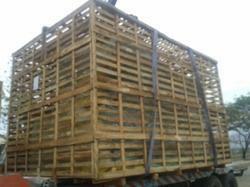 We manufacture wooden crates suitable for heavy loading while transporting goods in bulk quantities. These wooden crates or wooden packing cases meet all accepted standards for durability. As always, we can give our clients a range of dimensions to suit their requirements. We are providing the Wooden Packaging Materials in best quality to our customers. Made from finest quality wood, the offered seaworthy wooden packaging boxes are known for their ability to tolerate harsh weathering conditions and high load carrying capacity. Used in packaging industry, the offered seaworthy wooden packaging boxes are rendered by us in different sizes. 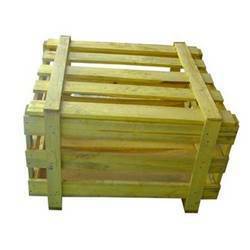 We are providing the Crate Pallets in best quality to our customers.Our Crate Pallets rate high on quality and are made of premium quality material. Wooden Crate Boxes are rigorously tested to assure their durability and better performance. We manufacture wooden crates suitable for heavy loading while transporting goods in bulk quantities. These wooden crates or wooden packing cases meet all accepted standards for durability. As always, we can give our clients a range of dimensions to suit their requirements. Looking for Wooden Crate ?